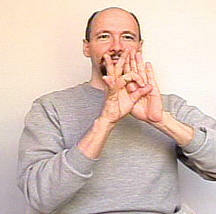 American Sign Language: "flunk" or "get an 'F'"
Think of your non dominant hand as the research paper you just turned in. Think of the dominant hand as the grade I just assigned you. Sorry, you should have gotten more references and spell checked eh? 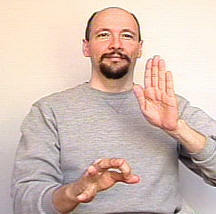 FLUNK: The thumb-side of the right "F" hand slaps up against the left flat hand palm. Sample sentence: Have you ever gotten an F in class before?